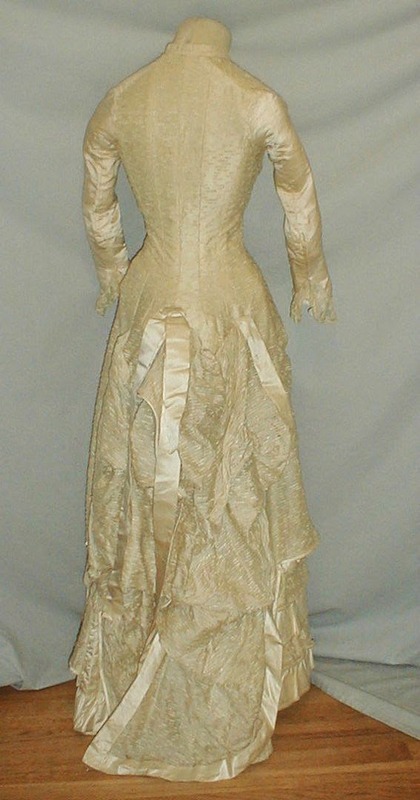 A charming 1880’s ivory textured silk bustle dress. The one piece dress is deigned in the Princess style. The fabric has a raised small line pattern. 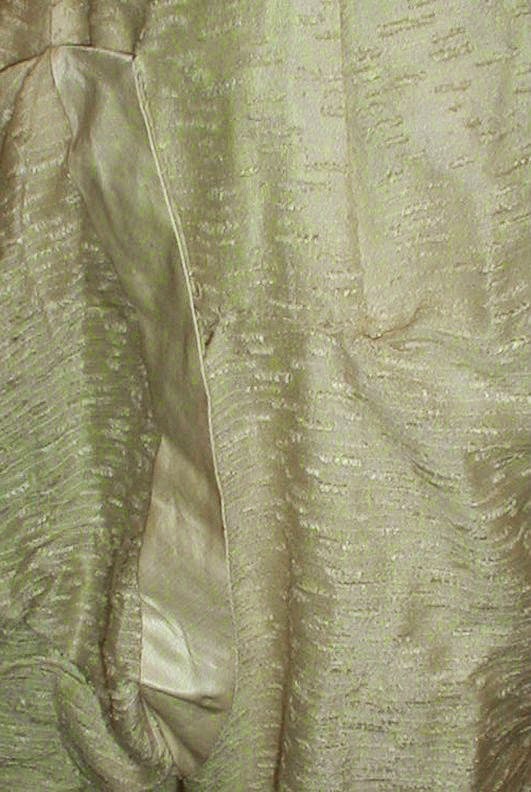 The sleeves and front panel on the skirt are made of ivory satin. The bodice has a cut out neckline that is edged with ivory satin. The skirt front has four ruffles made of both fabric. 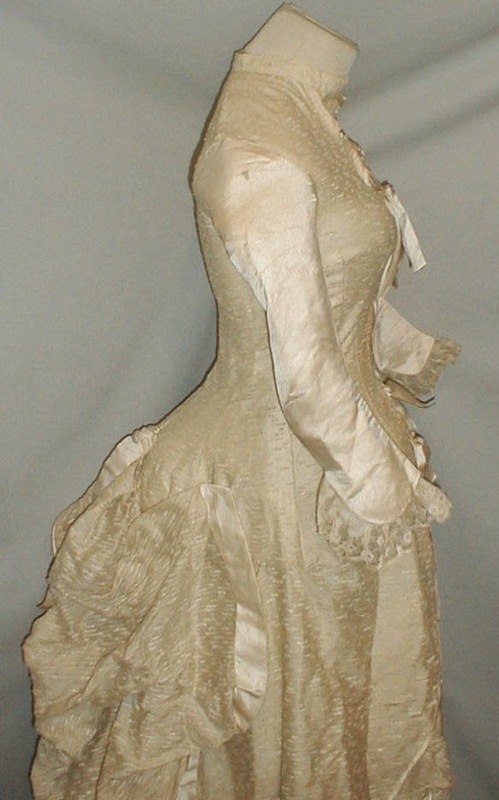 The back is gathered into a bustle effect. The front opening and back are trimmed with ivory satin ribbon The dress is lined with cotton and has a front button closure. It is in good condition. There is some very light underarm discoloration and fraying under one sleeve. The sleeves have some barely visible line age marks. The skirt has a few scattered ½ inch splits and one 4 inch repair on one hip. The dress is for display ONLY. Bust 30 Waist 22 Front length from shoulder to hem 51 back length 54. I'm a bit torn on this one as to whether it's 1870's or 1880's. 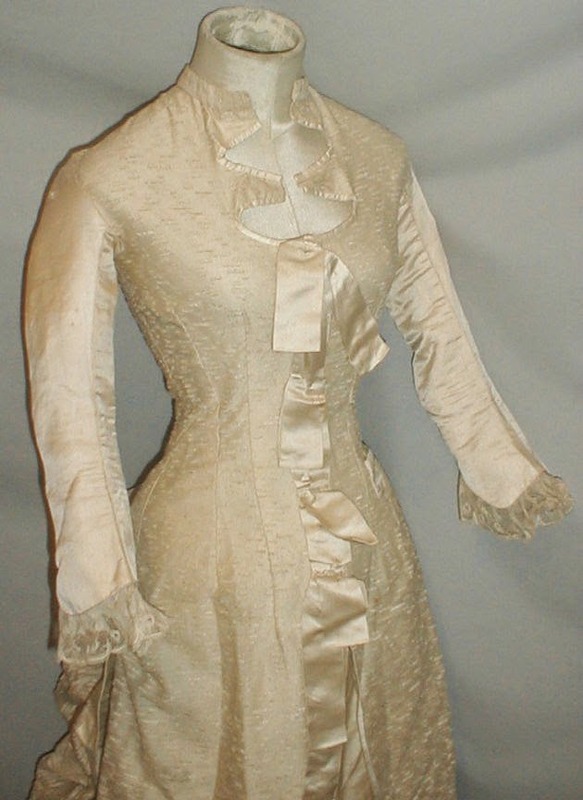 The sleeve length is more 1870's but the overall design is more 1880's. 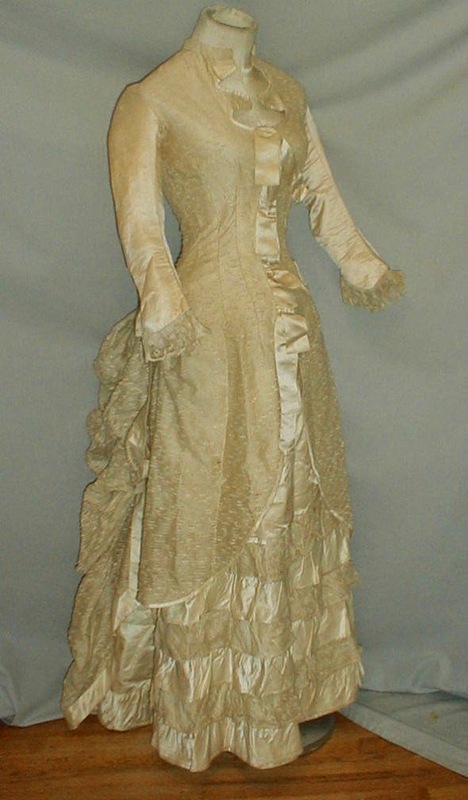 Maybe 1883, right when the bustle came back into style? My first thought was 1883, too. It just looks too late 1870's without that bustle. 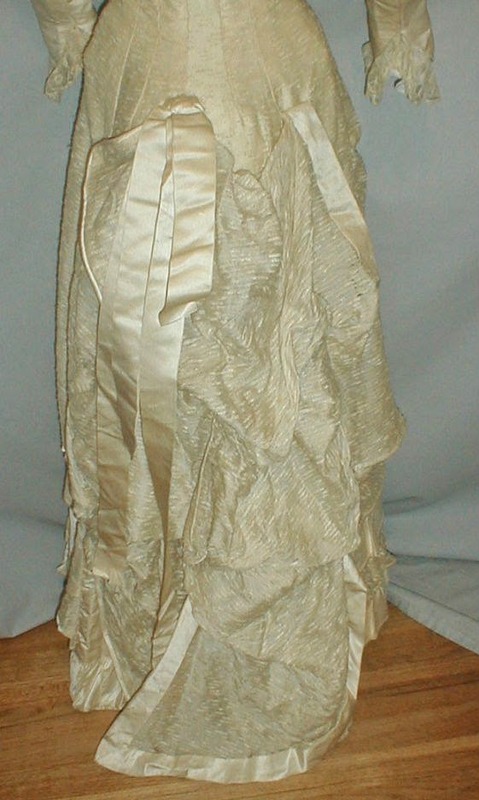 I wonder if the bustle was added later when the style changed again? Saw this and I thought of your blog: this clearly 1980s or 1990s dress is being sold as a "TRUE VTG Flapper Great Gatsby 1920s" but it gets better! 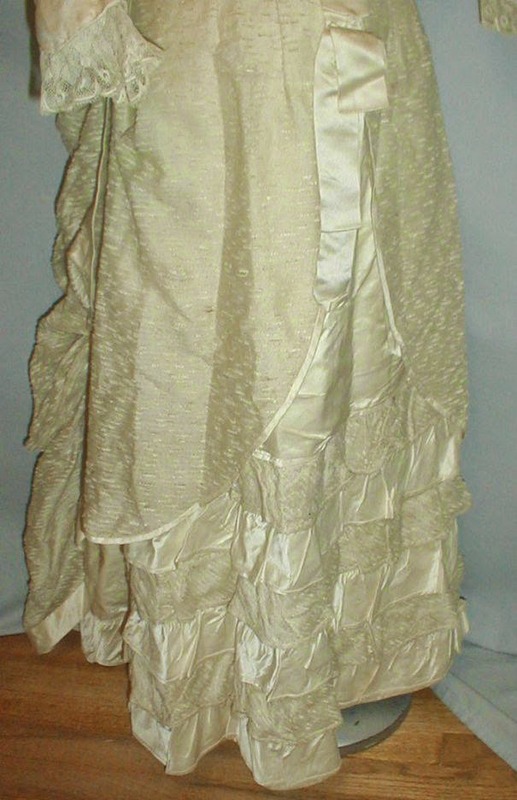 In the description, the seller says "I think it was probably made in the 70s or 80s, but I am a costume designer, and I can tell you it's defintiely spot-on for the 20s"... I've been looking at this dress for the past 10 mins and couldn't find one thing on it that indicated that it is "spot on" for the 20s! Why do sellers lie? Yes, because we all know the were all about invisible zippers in the 1920's! ...It actually looks a lot like my Mom's wedding gown from the late 70's - although this one is probably more early 80's. I keep hoping that a lot of the sellers are simply clueless - I know quite a few are- and that they speak out of that ignorance. If that's all it is, it can be corrected. However, I know one or two where it's not quite that simple. ...Besides, for this dress, it's giving me more of a 1930's impression than 1920's - with the open back, the length, and the slight puffy of the sleeves. I definitely thought 1870s when I saw it. Or maybe even a good movie or theater costume, which might account for it being hard to place? This particular seller is very good about only posting actual extant garments - he has a booth at an antique mall in Gettysburg - so I doubt a reproduction would get past him.